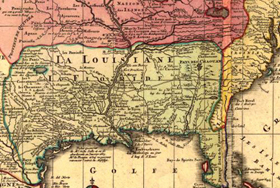 The European presence in what is now Alabama began in the early sixteenth century, when Spanish explorers reached the Gulf Coast. In 1540, Hernando de Soto and his men became the first Europeans to traverse Alabama’s interior, bringing death and destruction to several Native American towns on his route. It was not until the arrival of the French, in the persons of the Le Moyne brothers, that the first European settlement was established, with the founding of several colonial towns including Mobile in 1711. The French soon entered trade relationships with local Native Americans centered on slavery and deerskins. Wars raging between Spain, England, and France in Europe during the first half of the eighteenth century resulted in shifting control of various parts of the Southeast, and shifting alliances with local tribes. These alliances would take on a significant role as the American Revolution played out in the region in the late eighteenth century and would shape the settlement patterns and economic character of the Southeast as it entered the territorial period.